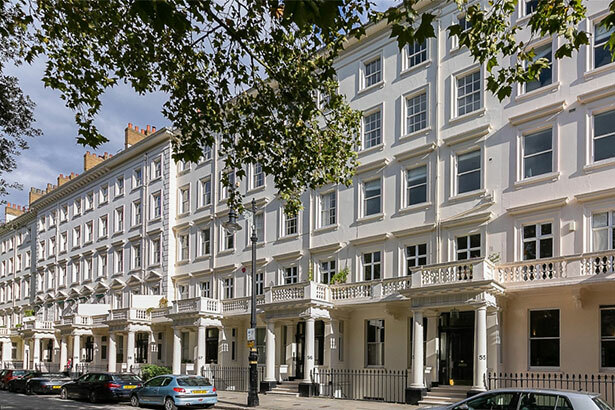 Located in one of the key buildings of Pimlico’s leafy Warwick Square, sits a super-sized penthouse with some of the most exquisite lateral living space in the area. Configured over two floors across three elegant Grade II listed buildings, this truly unique property features five bedrooms, over 500 sq.ft. of private terraces and access to Warwick Square’s exclusive award-winning garden, tennis courts and children’s playground. The 3,756 sq.ft. duplex penthouse is currently on the market for £7,000,000 with leading London agents Russell Simpson. Set on the fourth and fifth floors, residents are welcomed into a spacious entrance hall, with an east-to-west aspect allowing for excellent natural light. Amongst the meticulously redesigned interiors lies a formal dining room and contemporary kitchen/breakfast room, which has been fitted with the latest integrated Miele appliances, sleek work-surfaces and complementary white cabinetry. The fourth floor also houses three en-suite bedrooms, including one that is currently configured as a secondary reception room. Accessed via a dramatic curved staircase, the upper floor is home to the impressive master bedroom suite, which boasts direct terrace access, a spacious dressing room and en-suite bathroom. The upper floor also comprises an exceptional lateral living and entertaining space, including a 27ft drawing room complete with a bespoke, built-in bar and a separate library/TV room, which has the potential to be used as a fifth bedroom. Each of these areas enjoy direct access onto the west facing terrace, with tranquil and far reaching views over Warwick Square.